After a hard day’s ride covering 62 miles, we arrived in a small town in Punjab, Ahmadpur East. 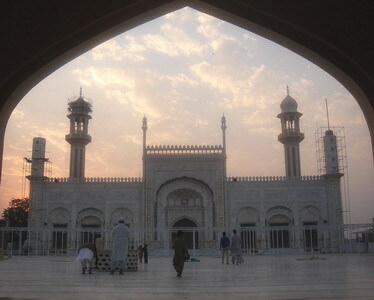 Our original intention was to stay in the historic town of Uch Sharif, 20km further back, however we were miffed to find out that there were no rooms available in town! So we had to cycle on to the next town on our route. As we were checking in to the resthouse at Ahmadpur East, we were greeted by an influential local businessman who spoke perfect English and took us under his wings, even doing the haggling with the hotel manager for us!! Later that evening we were taken on a guided tour of the city bazaars at night by ‘uncle’ and his nephew, 20 year old ‘I love my Pakistan’ Wassim. The police normally frown at us fraternising with the locals and stepping out of hotel boundaries at night, but uncle pulled rank for us and off we went, with police guard in tow. We spent a very pleasureable evening walking around the lively bazaar area, sampling bits of food from every stall and even trying out wedding dresses!!! 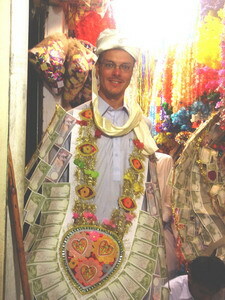 Nic looked particularly handsome in his bridegroom gear – the garland around his neck is decorated with rupee notes and is a traditional present from wedding guests. Pakistan really comes alive at night, and the sights and smells are difficult to capture on photo! A few hours later, our tummies crammed with local delicacies (gulab jamans, sohan halwa, kheer, crushed sugar cane drink etc) we returned to the hotel to have a full dinner as well!! 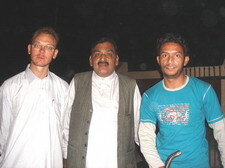 The next day we were accompanied by Wassim on his mountain bike to Bahawalpur, the next town on our route, only 35 miles away. We stopped at Bahalwapur for lunch, and decided to spend the night there at a good hotel, and explore the town that evening with Wassim, who knew Bahawalpur well. Being guided through the labyrinth of the local bazaar area, we bumped into ‘uncle’, who was in town for business!! We were taken around the town again on our second guided tour – exploring all the nooks and crannies and different types of shops, selling everything from pointy toed shoes (a local speciality) to cloth-dyers and tailors hand stitching garments. Uncle took us around the shops of several of his best friends – we were offered tea and halwa at everyone of them, until even Nic was satisfied! :p One of these friends was Iqbal, who was the chairman of the local jeweller’s market, and presented Sedef a lovely gold necklace and earring set as a gift!! Later walking around the local mosque, we met an Imam from Morocco, who had a lengthy conversation with Nic about Islam, even visiting us later in our hotel room that evening, with a gift of a great winter scarf for Nic!! !